ChocoMint DF ™ Protein & Fibre Bar is a delicious, chocolate-coated, high protein, dairy-free functional food bar, offering a generous 12 grams of protein per serving. This bar is an excellent between-meal snack and the perfect choice for pre/post workout nourishment. It is ideal for vegetarians, vegans, and individuals with dairy allergies or sensitivities, who cannot consume whey or casein. 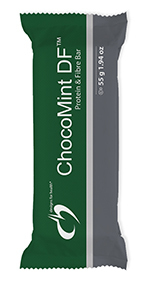 ChocoMint DF ™ is a low glycemic bar, yielding only 7 grams of net carbs. It is free of gluten, dairy, fructose and sucrose. chocolate, erythritol, inulin, cocoa butter, soy lecithin [an emulsifier], vanilla, reb A [extract of stevia]), maltitol syrup, isomalto-oligosaccharides (prebiotic fibre), glycerine, natural almond butter, tapioca syrup, brown rice crisp (whole grain brown rice flour [may have added calcium carbonate]), unsweetened chocolate, digestion resistant fibre (Fibersol-2®), coconut oil, natural flavour, cocoa powder (processed with alkali), sea salt, stevia extract.